While tape-based storage has been well established, it has evolved in a way that now delivers multi-terabyte capacities, superior reliability, longer media life and ease of access with linear tape file system (LTFS). Today, tape is recognized for its performance and cost effectiveness as organizations look to reduce storage expenses, while protecting and preserving their information for the future. For customers looking for long-term data solutions, Fujifilm’s BaFe technology ensures the future viability of tape technology. 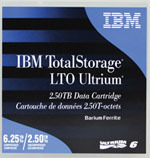 Reliable data storage remains a critical consideration for businesses, and advanced Barium Ferrite technology delivers dependability and capacity to organizations looking at their future storage needs. Barium Ferrite is the Future of Tape: Management of exponential data growth continues to be one of the greatest challenges for IT managers in light of shrinking IT budgets and environmental concerns. Tape storage is indeed alive and is the key to success in meeting the data growth challenge in a reliable, cost effective and environmentally safe manner. Since Fujifilm and IBM announced a world record in data density on linear magnetic tape of 29.5 billion bits per square inch using BaFe particles. 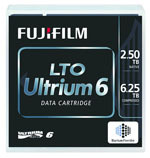 This demonstrated the potential of a high capacity tape cartridge capable of storing 35 Terabyte of uncompressed data. Barium Ferrite will extend the life of your drive - High signal-to-noise ratio of BaFe ensures maximum performance even when natural head wear occurs. Users can expect longer head life when using BaFe tape. Accelerated life test measures the change of tape’s magnetic property under temperatures of 60 degrees celsius, and humidity of 90%, where one day under such an environment corresponds to one year in ambient conditions. Tape storage continues to play a crucial role in today's modern data centers that are challenged with exponential data growth and limited IT budgets. Tape's role is expanding beyond back up and disaster recovery to applications supporting active archive, compliance, data preservation, scale-out NAS, cloud storage, big data and more.